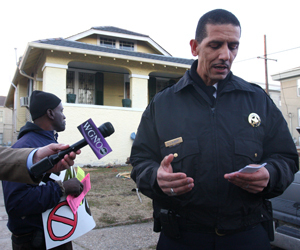 After months of beseeching the Uptown-based NOPD Second District for more individualized attention to their neighborhood, Milan residents finally saw the levels of police presence they were looking for this past weekend, they gratefully told officers Tuesday night. One weekend of suppression through heavy-saturation patrols and walking beats won’t stop the drug trade or end the gun battles, they acknowledged. But it did create a sense of safety and peace long missing from the neighborhood – and an impression that the police are listening to their concerns. “It is a huge step on the road toward getting the criminal element out of our neighborhood,” said Milan resident Veronica Sharkey. Residents organizing as the Milan Focus Group have been meeting regularly on their own and attending the NOPD’s monthly meetings since the fall. Last week, after a particularly violent shootout in March, they met with NOPD Second District Commander Darryl Albert, several of his top lieutenants and Councilwoman Stacy Head to request several specific police actions to stop the gunfire. During the NOPD Second District’s April monthly meeting Tuesday night, Sgt. Eddie Joseph was describing new calling cards that officers assigned to walking beats will begin leaving at homes they pass on their foot patrols, to let residents know that officers had been by. A contingent of Milan residents began murmuring their enthusiasm for the idea, and Jennifer Holden spoke up, thanking the officers for the walking patrols she had seen that weekend. The streets around her home were quieter as a result, Holden said. “Since our meeting, I have seen more police presence where previously there was none,” Sharkey said. “The fact that we met last Wednesday with you, and your response was so immediate, we cannot thank you enough,” said resident Helene Barnett. Eva Sohl of the Freret Neighborhood Center, which has been helping the Milan residents organize, said it is unclear whether the heavy patrols of the weekend will permanently reduce criminal activity at the specific homes residents have identified as epicenters of the drug trade. But over the weekend, residents were noticing police activity more than drug activity – and that was the source of their gratitude, she said. The meeting also included updates on the continuing decline in crime rates in the Second District, and current strategies for gun cases, traffic enforcement and summer deployment. To read our live coverage of Tuesday’s meeting, click “Replay” in the box below. As an aside, the beefed-up police presence described here stands in stark contrast to the “walking beats” touted a couple of years ago in Second District, which never actually materialized. Every few weeks, the captain or major would announce that officers would be walking a particular zone. Never happened. So the fact that Commander Albert is ushering in a new, visible and (hopefully) effective response to residents’ requests is, well, just plain refreshing! Oh, and when you see an officer walking (or driving) the beat in your block, be sure to show your appreciation … stop and chat, share your local knowledge, offer them a cold soda, give ’em a smile and a wave. Knowing the faces and habits of “the good guys” is invaluable to any patrolling officer, as is the understanding that “we got their back” the way NOPD has got ours.